Update: As I said politicians, especially former Illinois governors are indeed the gift that keeps on giving. Three years after this cartoon was originally published, it’s timely again. As Blago has just been sentenced to 14 years in prison. one of the stiffest corruption-related sentences in Illinois history. 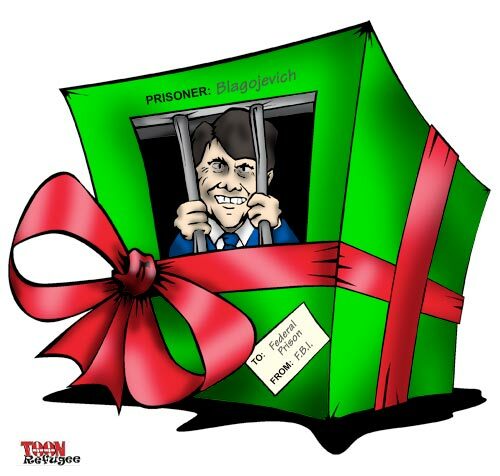 Illinois politicians seem to view the Governor’s office as “the gift that keeps on giving.” Fortunately, this year the FBI has a Christmas present for the citizens of the state: Governor Blagojevich all wrapped up and ready to drop down the chimney of one our federal prisons.